This is an oldie. We photographed a detailed overview of the Finglas Road cycle route in 2010 — it was just after the route had been renewed with works to improve sections of it and the lane markings repainted. A top-class featured unchanged in years is the wooden ESB pole shown in the background above (here’s our 2010 photo of it). Dutch and Danish cyclists will be looking on with jealous eyes — why can’t they have large poles in the middle of narrow cycle paths painted onto footpaths? They should be so lucky! 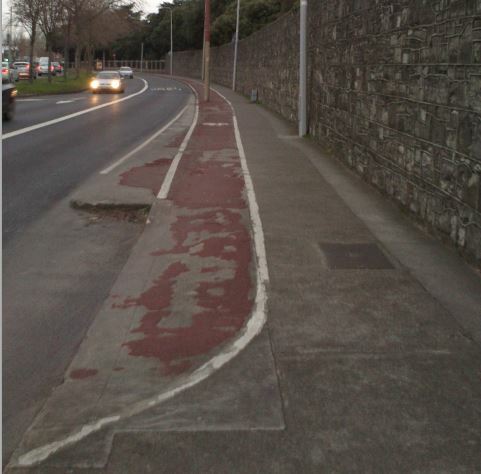 Some Dublin cyclists complain about the low quality red surfacing used on cycle paths, but the above pic compared to the image at the same spot four years ago shows that an impressive 50-60% of the surface on this section has lasted a few years! Why don’t more people cycle in Dublin? The city’s cycle paths are world-class. Apart from that, found myself on the stretch of road past the Point Depot between the bridge and the East Wall and counted myself lucky I am not a commuter there during the week. Scary road, red cycle path ‘paint’ makes the one in your pic look brand new. Good luck to all cyclists who find themselves there every day. The best time to fully enjoy all the delights of this cycle path is on Mothers’ Day. In addition to stray ESB poles, you can weave your way around parked cars, opening car doors and irate families visiting their departed Mammies. Actually, Sundays are nearly as good but the crowds yesterday were awesome. Further out the Finglas Road you have the choice of a combined bus/cycle lane or the pavement but along by the Cemetery you have to mix it with the bereaved or risk a premature and permanent visit to the other side of the wall.